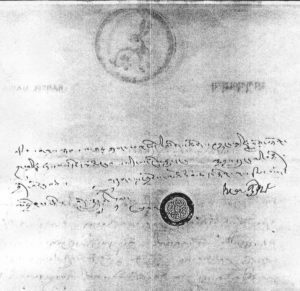 The Current Situation (TCS), as it was known, grew into a bitter dispute that seemed unresolvable, and over the course of the next three years, generated a flurry of letters and official statements, several of which are presented on this page. 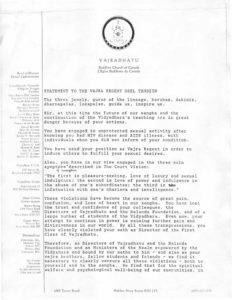 This letter from the Board, which asks VROT to step down, is the first official document of the turmoil. 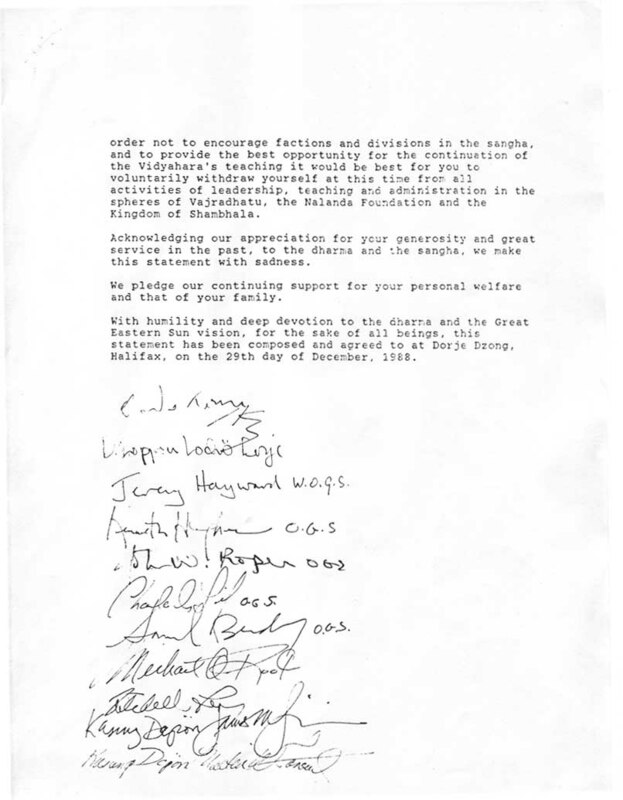 Because the board operated by consensus, and because individual members had very different points of view about what action to take, this letter was a hard-won compromise. 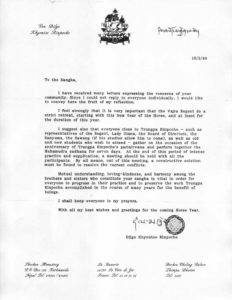 Although its existence and intent were widely known in the community at the time, the letter itself was never made public. 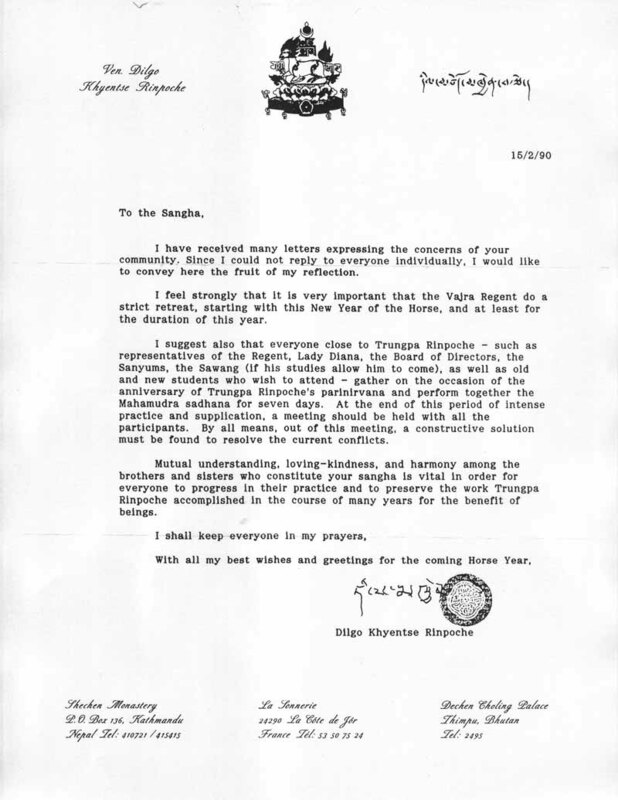 Writing to the community at the request of the Regent and Karl Springer, His Holiness says, “Those who are experiencing difficulties following the Regent now should realize that it is necessary to do so …”. This unequivocal message was met with simultaneous rejoicing and despair, and provoked the Board of Directors to send its own delegation to meet with Khyentse Rinpoche, Jamgon Kongtrul Rinpoche, and other prominent Kagyu and Nyingma teachers in Asia. 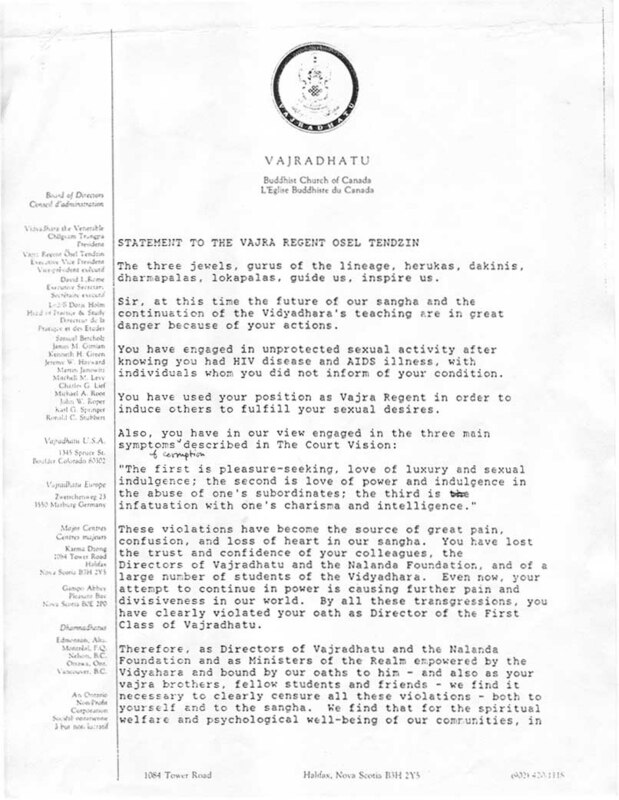 After receiving further information about the conflict, His Holiness suggests very strongly that the Vajra Regent go into strict retreat. 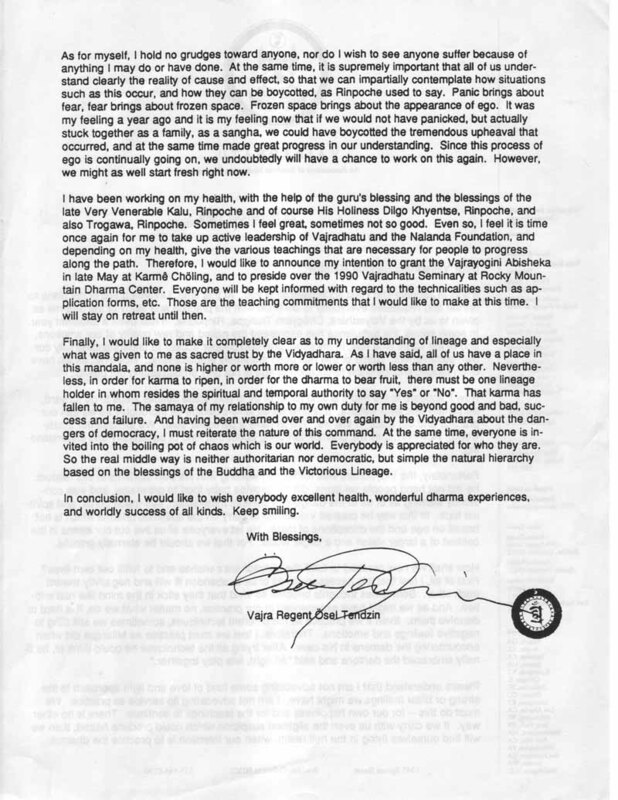 He also implores the sangha to gather together to practice the Sadhana of Mahamudra for seven days. He goes on to say, “By all means, out of this meeting, a constructive solution must be found to resolve the current conflicts.” This gathering never occurred. His Holiness’ replies comes quickly. 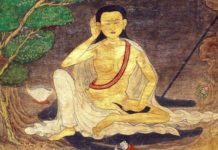 “There would … be neither purpose nor benefit in newly appointing a regent of the Regent, instituting a holder of his lineage, dividing the dharma centers into two sections and so on. 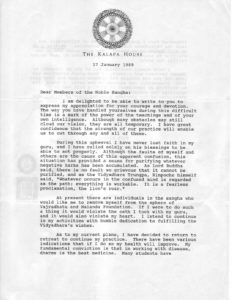 Therefore, it is important that, beginning now, any and all allegations concerning this be set aside completely.” His Holiness died in September 1991, just seven weeks after this letter was sent. 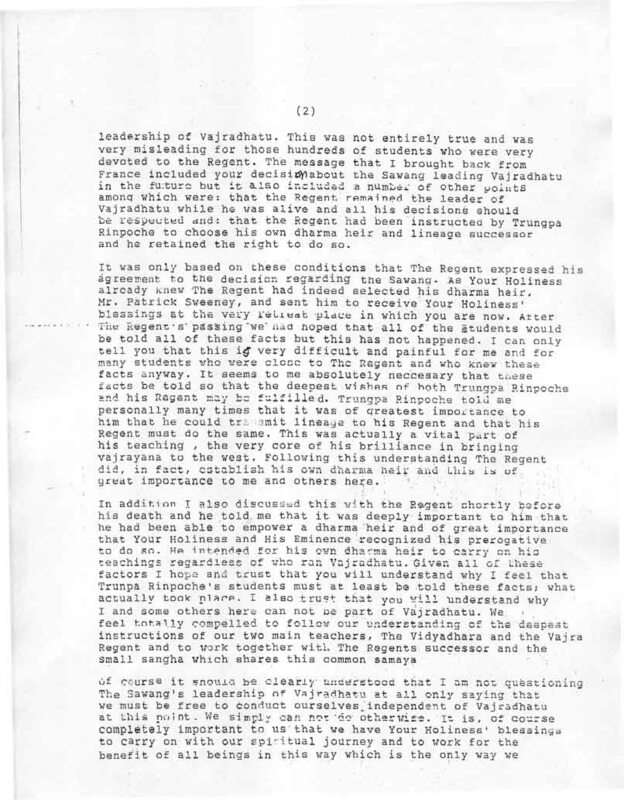 After receiving further information Kalu Rinpoche addressed the LA sangha in December 1988, just seven days prior to the Board letter to the Regent. Thank you to Tashi Armstrong and Suzanne Townsend for bringing this talk to our attention. It was added to the list of documents below on June 14, 2016. 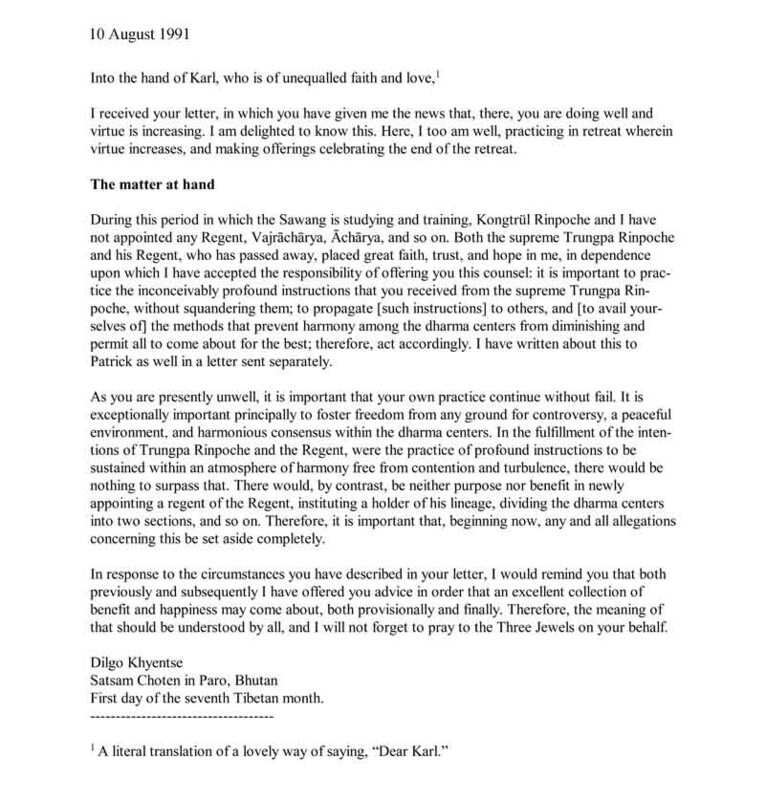 This letter has been brewing for 16 years, at times boiling over and burning the stove. I want to genuinely applaud your bravery for publishing the letters. What struck me most was the ever evolving path our community and teachers took as we continued to gather information and attempted to consider points of view that differed from our own. Having been very close to the sangha member who contracted HIV from the Regent, having been there at the moment he took his last breath, I feel somehow the beating heart of this family’s real pain has never been publicly acknowledged or apologized for. 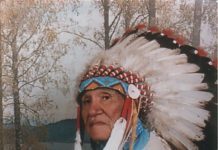 The path the family took who lost an only son, brother, lover, and best friend has been one of bravery, insight, intelligence and woundedness. I’ve seen this beloved family struggle, and there is nothing so horrible as seeing a mother grieve the loss of her only son, a sister grieve the loss of her only sibling, and a father grapple with the emptiness of losing his child. With the death of one so young come many losses. I was so fortunate to be able to alk frankly to this young man during the last months of his life. We talked about his pain and frustration, about his conviction that he contracted AIDS from the Regent, about his fear for the well-being of his family. We grieved the loss of his unborn children and his future. During this painful time, the family received no apologies; in fact they were often asked if they were sure this young man contracted AIDS from the Regent. There was much discussion about his past sexual history, as if he were a case study rather than an innocent. False and irrelevant allegations such as one of his old girlfriends used needles, this one was promiscuous, an uncle had recently died of AIDS, etc, abounded. Rather than embracing this family with loving kindness when they needed it most, they were often treated badly and gossiped about. The financial strain placed on his family was great, and no compensation was ever offered. His mother spent her entire retirement fund, and is now older than she would like to admit and unable to retire. They continue to face life bravely and without depression, and they are a strong, loving, and cohesive family. Have we reached the point yet where we can genuinely apologize? Perhaps the letters are a step in the right direction. 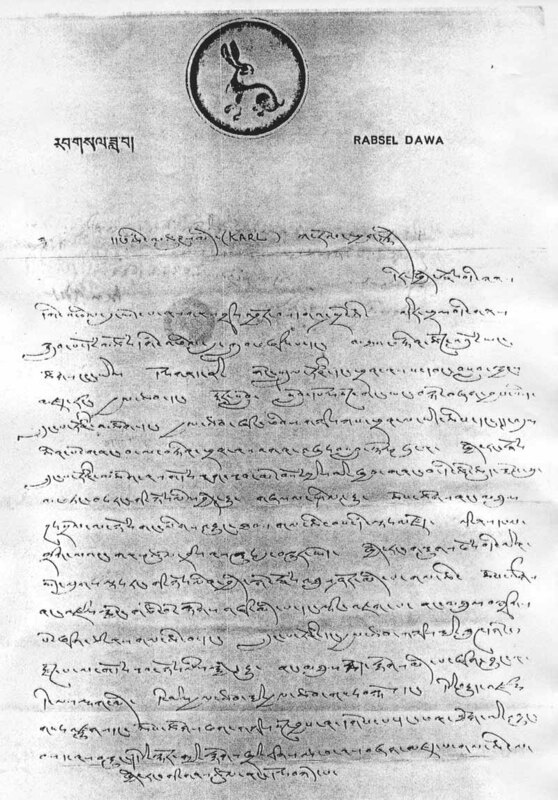 Thanks so much for publishing these letters. 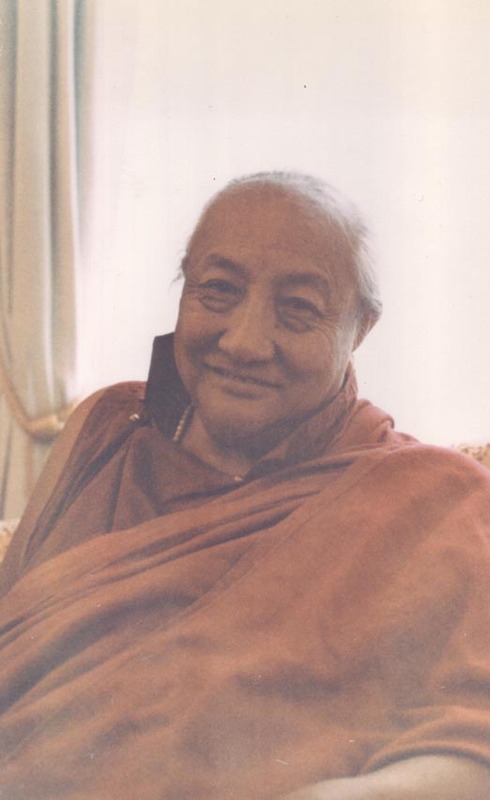 It’s especially helpful to our understanding of sangha history to see what Khyentse Rinpoche’s wishes were regarding the situation with the Regent. 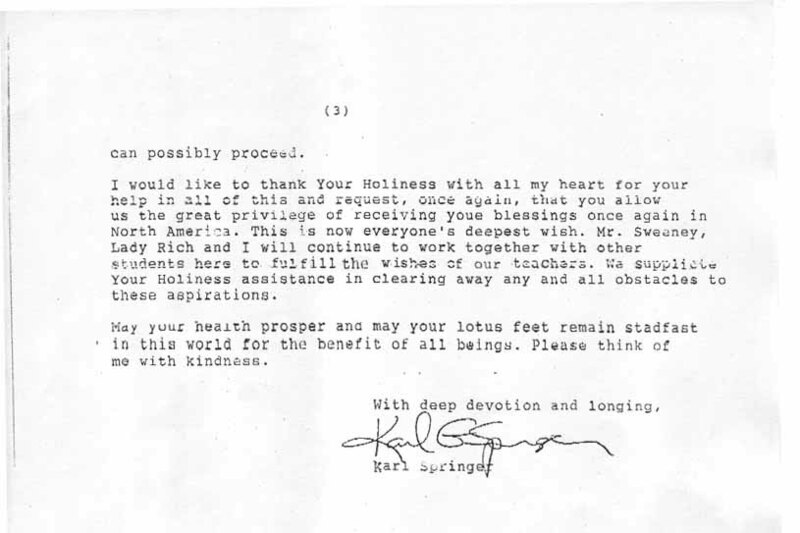 Those last two letters in particular raise an interesting question, though: When one supplicates one’s teacher’s own guru for an answer to a problem, does his reply carry the weight of “command” only when he says what we already want to hear? Or, if we disagree with it, does it then fall to the level of “suggestion” or–as seems to have happened here–something to be ignored altogether? How does the spiritual authority of lineage actually operate in these situations? At long last a compassionate public airing of this difficult issue. 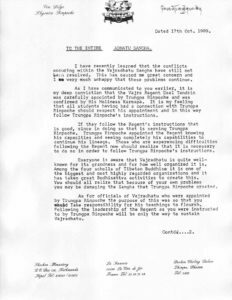 I appreciate your recognition of the intelligence of the sangha to contemplate those times with the revelations of the letters. For me it is both an inspiration and a relief. Thank you so much for posting these. It is extremely helpful in understanding what was so confusing at the time. It’s unfortunate that we couldn’t have access to this information a long time ago. 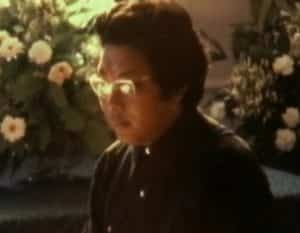 Thank you for your excellent work chronicling the life and works of our root guru, Chögyam Trungpa, Rinpoche. 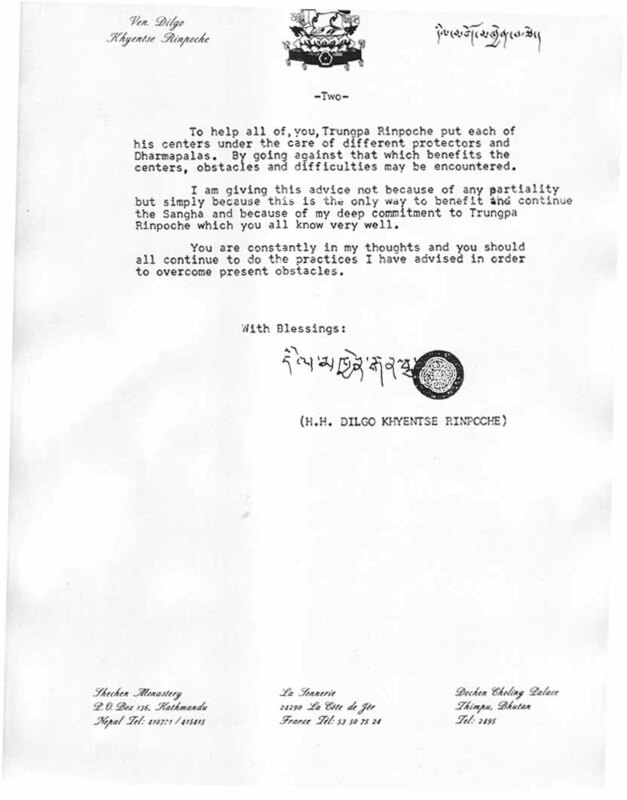 Thinking how to write in response to the letters concerning “The Current Situation”, it will, I think, establish my priority to say this: When His Holiness Jigme Phuntsok, Rinpoche, was at Dorje Denma Ling some years ago, I asked him what to do so as to be able to keep taking rebirth in a way that I can be a Dorje Kasung in Shambhala for many lifetimes to come. He told me, and I’ve been working on it ever since. As I am getting very old, probably I’ll have a chance before long to find out whether my practice has been sufficient. 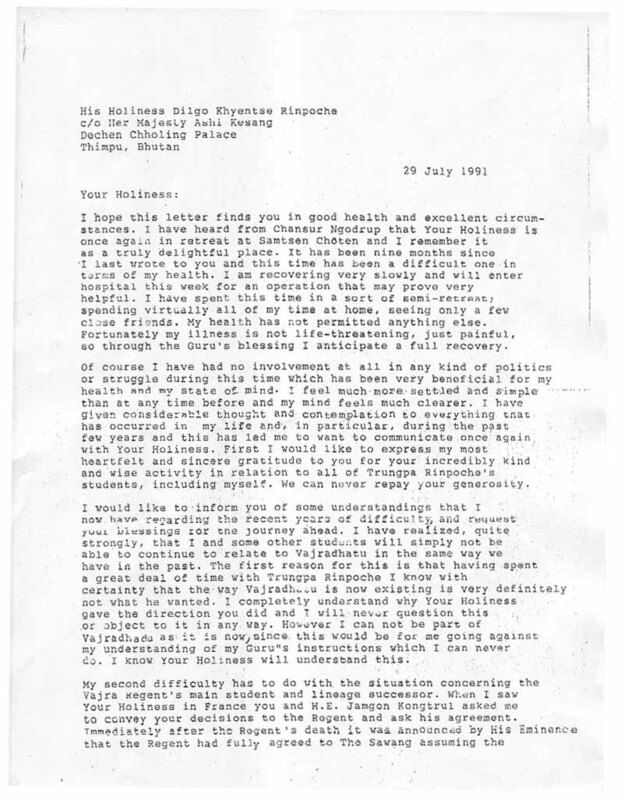 As I read the letters, I noticed that my discursive mind would be willing to get back into the pain of it all. At the time, I was intensely engaged. 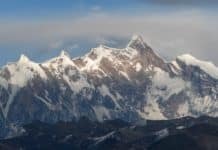 Now, I choose to focus on those aspects which are most likely to lead to the further success of Shambhala, with all that entails. I choose to remember aspects of the Regent’s kindness and brilliance. 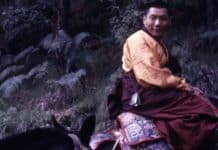 I choose to think of the devotion of all the students, whether they felt it necessary to take one side or the other, and however they manifested their allegiance. 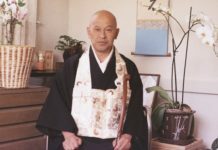 I feel sad at the pain that many have felt as a result of TCS, and I am glad that we now have additional clarifications which may help us all to let it go, as we continue to follow the instructions of our incomparable teachers. I just wanted to thank you for all of your work with this project. 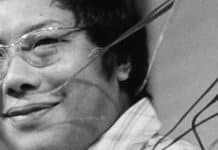 The Chronicle website is one of the only ways that new students can get a historical understanding of the legacy of Chogyam Trungpa. 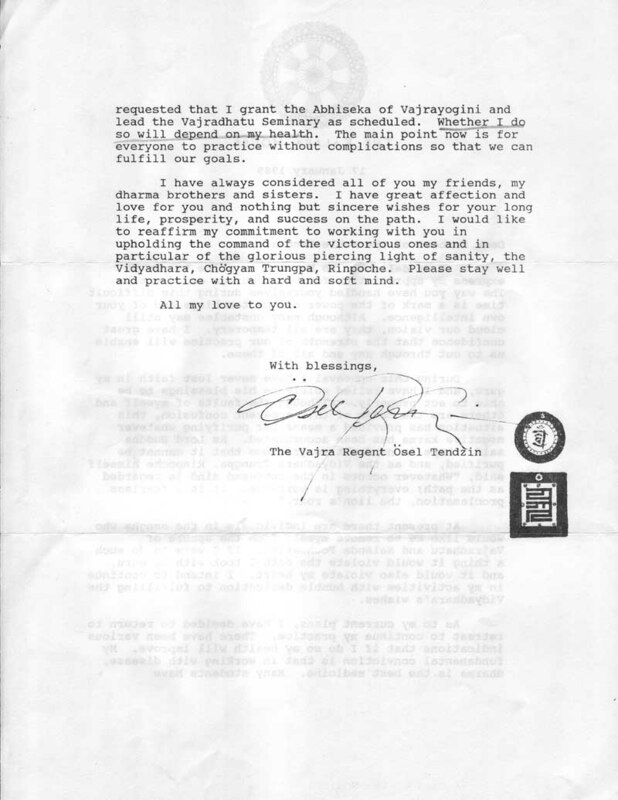 Whenever I feel uninspired, I read Trungpa Rinpoche’s will, on the Chronicles. 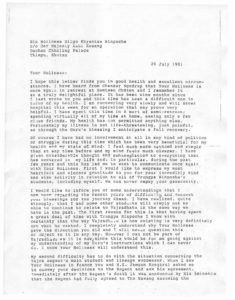 As someone who joined the community in 1990 (and never really did much exploring into the painful past), I really appreciated reading these letters. It gave me a much better sense of what happened and the various “positions” people took and what they thought about why they took them. Thanks! 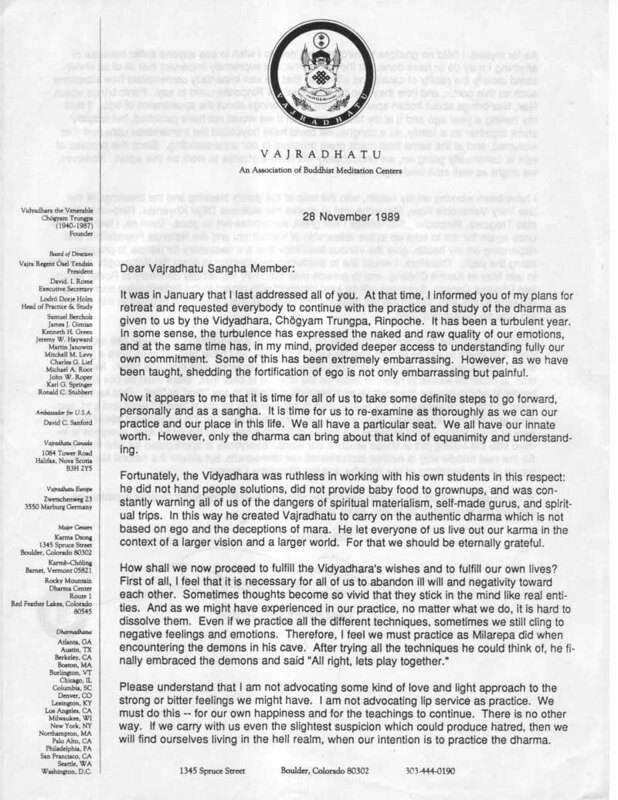 Thank-you for posting the letters, as I had come into the sangha a couple of years after the death and when Vajradhatu was just starting to pull itself out of TCS, I appreciate seeing what our teachers had to say. But I do disagree that this should not be discussed in an open forum, but by posting a selection of mail sent to you, this in some ways seems to be a big problem with this whole situation. It never seems to want to be discussed freely, it has been almost 16 years. It is the past, but part of our history and also some of our future. An open discussion would allow people to communicate their feelings, their grief, get answers, questions, and maybe finally let go of some of their resentment. But only seeing letters will bring out in some more resentment, with nowhere to voice it. I have been trying to overcome a lot of these issues in a web forum, http://enlightenedsociety.org/. 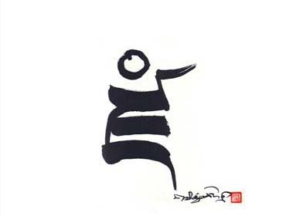 (though getting sangha involved has been like finding gold) I believe we need more communication. I have thought about putting up a forum dealing with this. It could always be made private, which I have thought about a lot of the topics on it. Just wanted to say thank you for all your efforts with the Chronicles and thank you in particular for the “letters to the editor” approach to the postings on this topic. We are worse than the Palestinians and Israelis when it comes to this issue. I wonder now why you choose to stir this bitter pot? 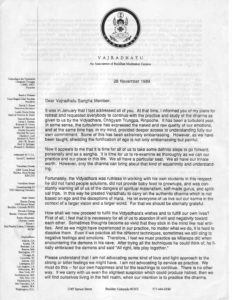 No doubt many will applaud your decision, but I had thought of the Chronicles as a dedication to the life and teachings of the Vidyadhara, not a foray into the difficulties, tribulations, errors and omissions of those of us who have seemingly survived him. Have the Chronicles become a political platform? One of the things that I have cherished about this site is that it’s not political. It has had no need to promote, and it has had no need to vilify. Has that become very important now? Thank you. 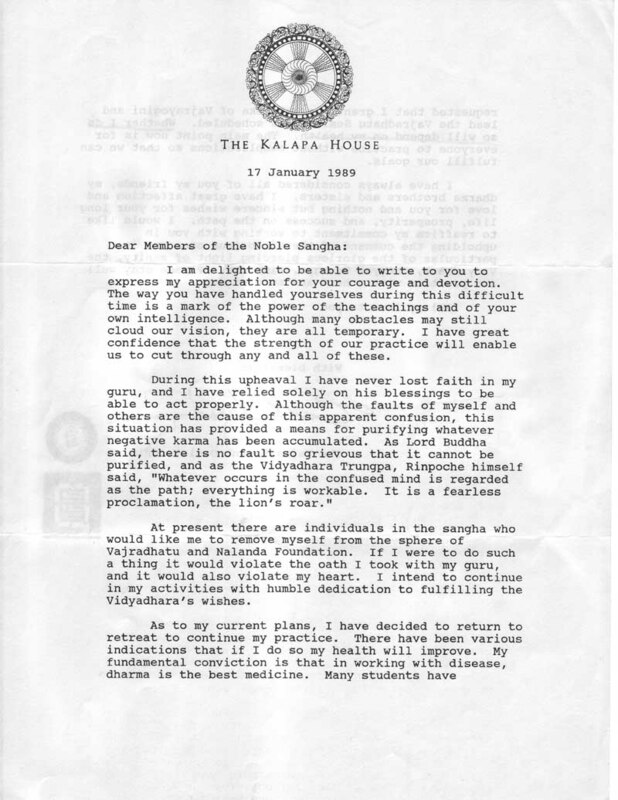 I’m grateful that you took the time to write such a heartfelt letter. Yes, the Chronicles are a dedication to the life and teachings of the Vidyadhara, and yes, I suppose that is often a foray into our difficulties, tribulations, errors and omissions. 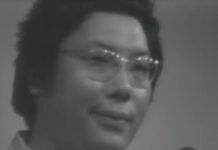 Trungpa Rinpoche was surrounded by political turmoil throughout his life, starting in Tibet and continuing through his years in India, England, and North America. If we’re going to edit out all the politically sensitive parts, it’s going to be a very short story. I agree that it’s a bitter pot, but pretending it’s not there doesn’t make it any sweeter. 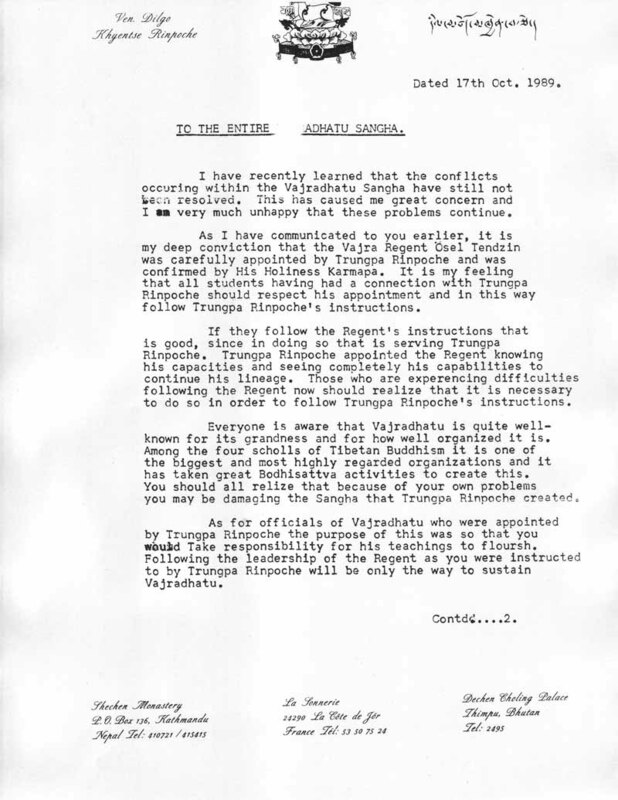 However painful it might be to read them, these letters are important historic documents and, as such, they belong in the Chronicles of Trungpa Rinpoche’s life. They speak for themselves and they present several very different points of view. Is making them available somehow taking sides? If so, how about keeping them hidden? Wouldn’t that be taking sides as well? 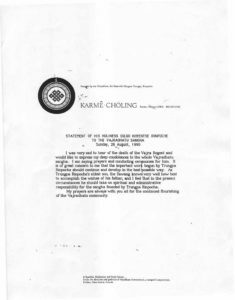 From my point of view, once they were in our hands, we had an obligation to add them to the public record. Bravo. A brave decision, and the right one. What was The Current Situation? 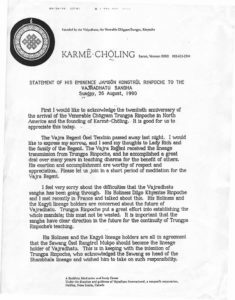 In late November 1988, rumors began to circulate that the Vajra Regent Osel Tendzin was sick with AIDS and that he may have infected a sangha member with HIV. Regardless of your point of view on the issues, the turmoil that followed was excruciating and heartbreaking. 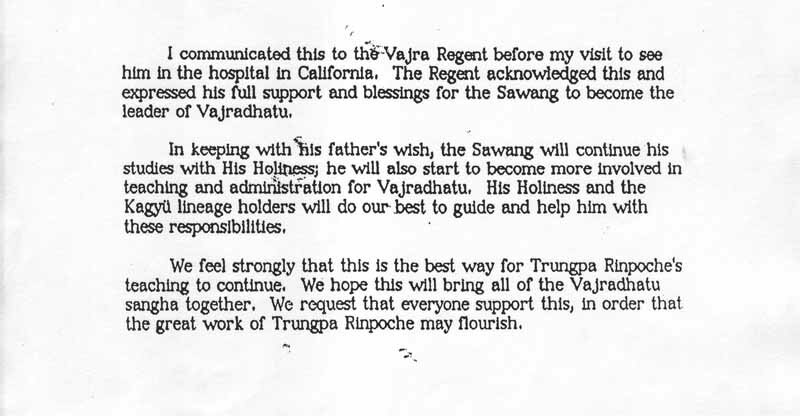 Many sangha members called for the Regent to step down, and many others expressed their support of the Regent's continued leadership. 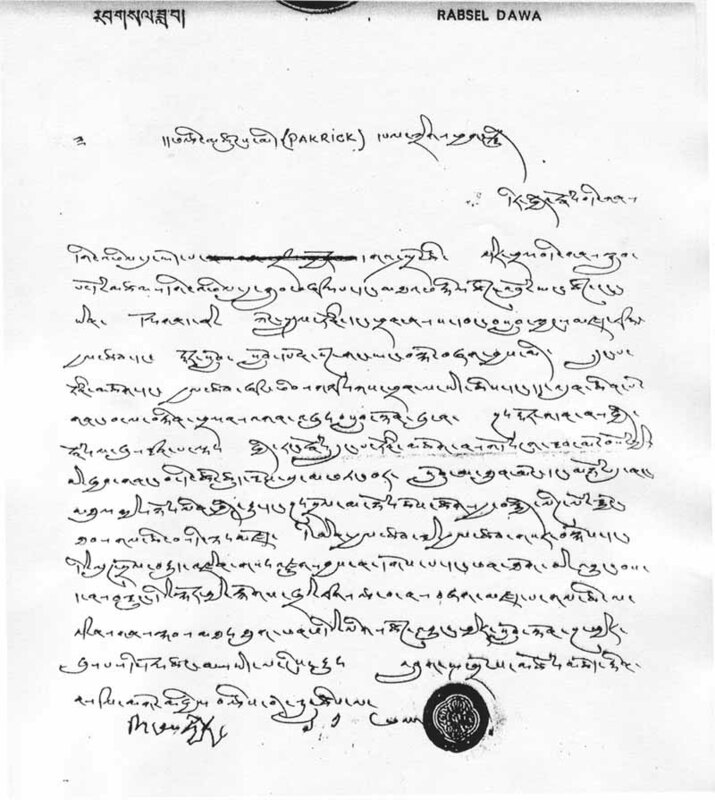 The Current Situation (TCS), as it was known, grew into a bitter dispute that seemed unresolvable, and over the course of the next three years, generated a flurry of letters and official statements, several of which are presented on this page. 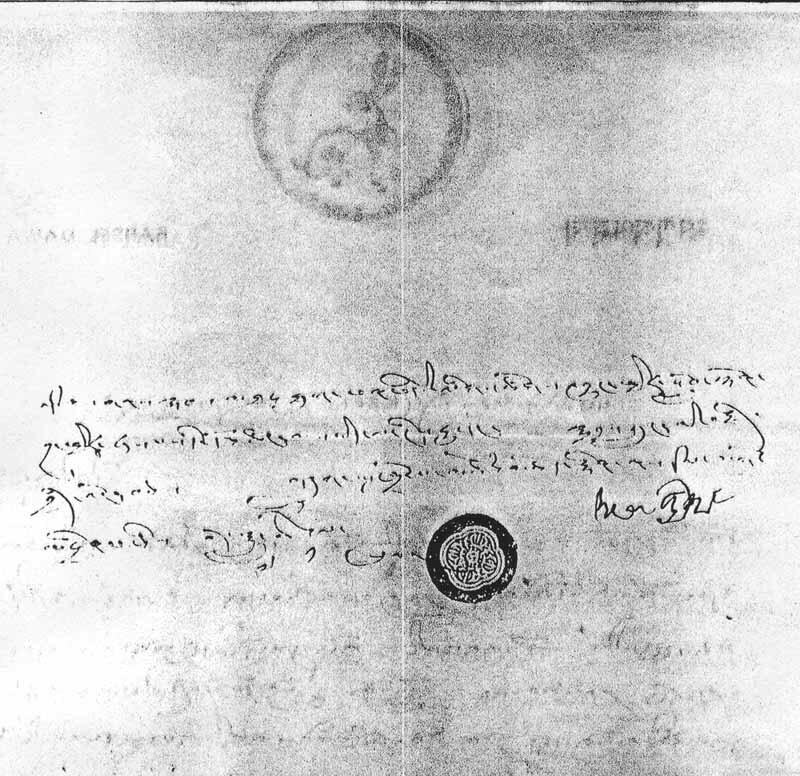 Most of these letters and documents were widely circulated at the time. 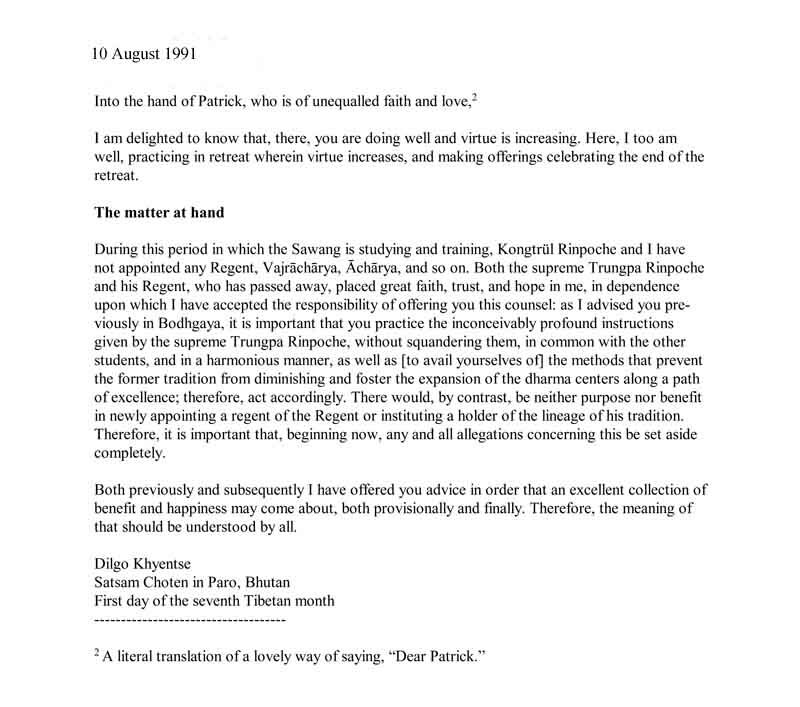 But the last three—Karl Springer's letter to Khyentse Rinpoche in July 1991, and Khyentse Rinpoche's letters in reply to Karl Springer and Patrick Sweeney a few weeks later—have only recently come to light and are presented here for the first time in a public format. Khyentse Rinpoche died just seven weeks after these letters were sent. Before his death, he left copies with one of his students for safekeeping and said that they might be useful someday. Last summer (2005) these letters made their way to North America, where they passed through several hands before finding their way to the Chronicles.